Posted on November 11, 2013 Posted in 2013, Baby, Musing Monday, NL, Parenting, St. John's	. This weekend was a long weekend for us because November 11th, fell on a Monday. Les we forget. 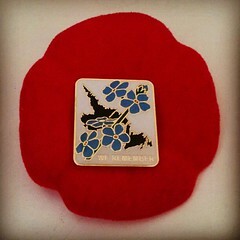 The flowers on the pin are Forget Me Nots which were an emblem to honour Newfoundland’s original Remembrance Day on July 1. Sometime, people will use this flower in November. Today in Canada, it’s known as Remembrance Day and is a day we take to honour those that have fought for us and continue to do so. Posted on October 31, 2013 Posted in 2013, Family, Holidays, NL, Nostalgic, St. John's, Throwback Thursday	. If you’re Canadian and French was taught at your school (which is pretty much every school since I think they all had at least core French), then this time of year you would have heard the infamous song C’est l’Halloween. I love that a CBC Music post from last year is floating around Facebook this week. It brings back an air of nostalgia where you can’t help but sing along enthusiastically when the song’s chorus starts. 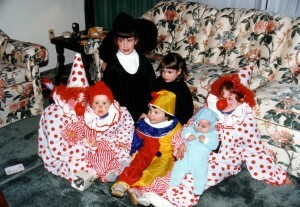 Growing up, I always enjoyed Halloween. 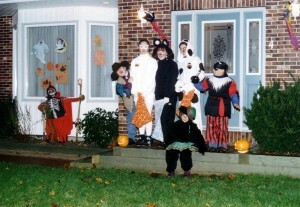 Whether I went trick or treating in Kilbride when we lived there, or in Cowan Heights after we moved; it was always so much fun. One tradition I loved was going to my aunt and uncle’s house where we’d trick or treat in the neighbourhood and then go back to their house and enjoy some treats with family. This is from the early 90s… not sure what year. But aren’t we so cute?! Based on how little my cousin Adam is, I think this photo is from 1987. So much cuteness! 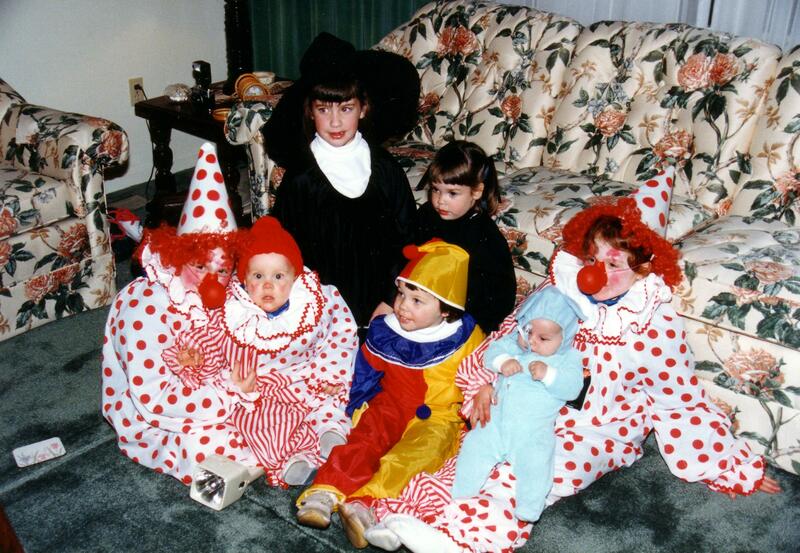 Halloween in Newfoundland and Labrador often included costumes that were either extra big so that you could wear a snow suit underneath, or sometimes you incorporated your extra layers of clothes into your costume. I mean, we didn’t have snow every year, but wow – it was pretty cold some years! Yet in the name of candy and the desire for a sugar high, it never did stop us and it certainly doesn’t stop kids today! 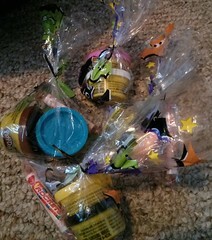 This year, we’re giving out some mini candy bars, but for the younger kiddos, we’re handing out little Halloween bags that have a Rocket and two mini Play-Dohs. Lots of candy will be acquired tonight, so I like the idea of giving something that will not simply give a sugar rush (OK so the Rocket will be guilty of that), but the Play-Doh is something fun. Posted on October 14, 2013 Posted in 2013, books, Musing Monday, NL, Parenting, St. John's	. Something I’ve been trying to do with Missy Moo is take her to places for fun and new experiences. Even when she was just a few months old we were going weekly to story time at one of our local libraries. It’s not always easy to go out with her, especially now that she’s getting more mobile, vocal and independent… we went to Reel Babies recently and it was interesting to say the least. Thank goodness my mother was there with us! Next weekend, there’s a fun family activity coming up that we’re definitely going to attend. It’s called CBC Reads with One Book, One Child. CBC Newfoundland and Labrador is partnering with Literacy NL, Community Food Sharing Association and the Avalon Mall to help facilitate a conversation about literacy in our fair province. 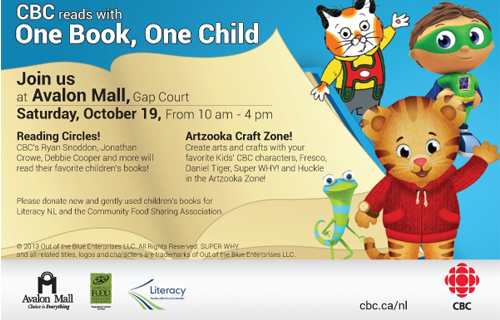 What’s fun is that some of our local CBC personalities will be there to read their favourite children’s books. So if you want to hear Here & Now’s Jonathan Crowe, Debbie Cooper and Ryan Snoddon share their book, it sounds like the place to be. I wonder, will Ryan choose a book about weather? Just a sample of the many books in our house! Our little family will be going and so should you. Maybe we’ll see you there! 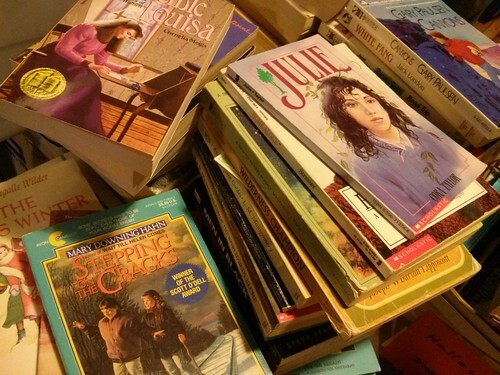 If you do go, you’re encouraged to bring along new and gently used books as a donation to Literacy NL and the Community Food Sharing Association. All books donated that day will be given to local food banks and distributed to families and children. It sounds like a fun event for an important cause. I’m sure we can find some books to donate. And books for all ages is encouraged. I was chatting with my mom just the other day about my reading habits. When I was young, I loved to read and it was something my parents always encouraged. Both my brother and I were avid readers (although I think he had more of a passion for it than I did). I remember going through lots of books and also enjoying library visits where I could find something new or fun. Do you remember the Baby-Sitter Club books? I had a few… oh yeah. I loved those books. My eldest niece currently has them, but I suspect her reading level is beyond BSC books, but they are a nice easy and quick read. Into adulthood, I’ve noticed that I don’t read as often as I like. I think part of it is the busy lifestyle we have, but part of it is due to my ADHD. It takes me long enough to get ready for bed at night that by the time I am, it’s really too late to lie back and get through a chapter or two in the latest read. One might say I’m really good at dilly dallying. But with so many books in our house, I’d like to really work on reading more. It’s something I hope Missy Moo will also enjoy since Matt is a super-fast speed reader who devours books. I’ve been reading to little miss and am starting to notice that she’s liking some books more than others. One book that she absolutely loves is Good Night Moon. I’m not sure why, but maybe it’s the fun contrasting colours, or something about the words. All I know is that she gets excited, bounces up and down and grabs at the book whenever we start to read it. Thank you Auntie Christina, Uncle Joseph and Theo for that book. She loves it! I wonder if someone will read Good Night Moon on Saturday? We’ll have to wait and see. Posted on July 26, 2013 Posted in 2013, NL, St. John's, Tely 10	. The Tely 10 is on Sunday. 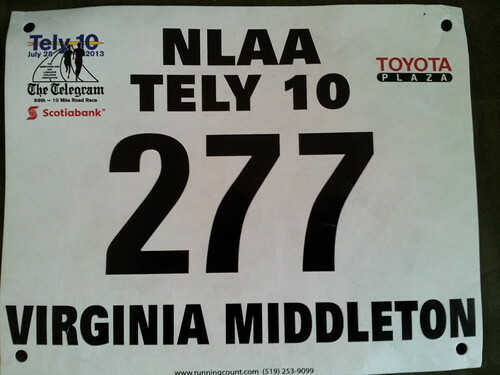 Last year I ran the Tely and did much better than I expected; especially since I was eight weeks pregnant at the time! Even before giving birth to Missy Moo, I had already decided that I would run the 10 miles/16 kilometers from Paradise, through Mount Pearl and into the east end/central part of St. John’s. Ideally, I would have been running multiple times a week, but with a baby that’s just now five months old and weather that’s rather unpredictable, I haven’t been able to run as much as I’d like. This cartoon was in the Saturday’s edition of The Telegram, our local paper for the metro area and boy did it hit home for me. Ha ha. Now I’m staying cautiously optimistic. I can do this. I know I can. To beat last year’s race time of 1:53:39 would be amazing, but I won’t be completely crushed if I don’t. Just running it again this year is a big win in my books. In the last year and a half I’ve had a lot of life experiences that have only made me stronger. From surviving my month in Taiwan to giving birth to my first child, I think I’m a different person than before any of this started. I’ll just use some of these experiences to motivate me to never give up on goals I have (including running the Tely on Sunday). Last year Bobble-head Ted and I ran together for the race (truth be told, he didn’t train much and I had to do most of the work, but that’s OK). He’s been rather quiet online lately and has expressed an interest in sitting out the Tely this year. Maybe next year he’ll return as my running partner. So if you’re running in this year’s Tely, let me know! 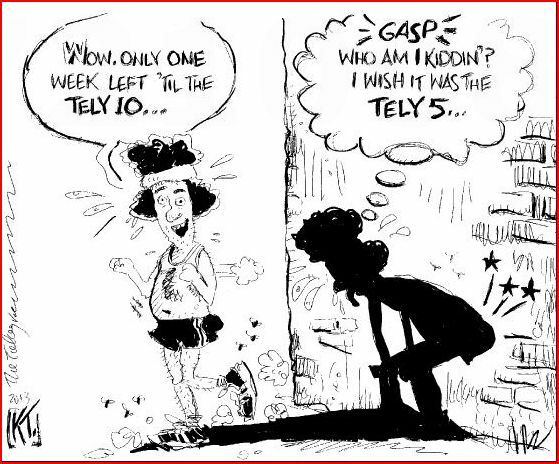 And if you’re going to be one of the many awesome people watching and cheering on the runners and walkers, please yell a little extra loud this year because it looks like it may be rather humid day and we’ll need all the motivation we can get!